To begin with some disclaimer, I am not entirely sure how I ended up here. I know there was never some end goal to work with lingerie. I do feel like the sheer sheerness of it all is promising to create some intriguing anthotypes for the Somnambulist project. This is an extension of the sleepwear. 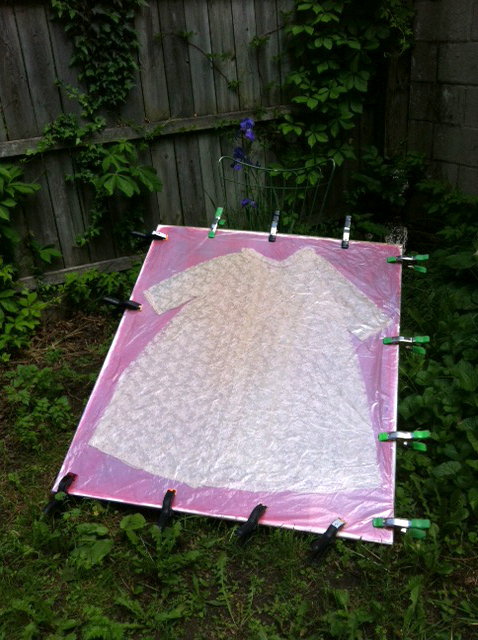 Two, maybe two and one half, years ago I began using pajamas as a light resist. The reason was a memory of my father when he was in the hospital sometime in 2004 wearing pajamas, which brought up a childhood memory of seeing him late at night in pajamas in his rocking chair, cocktail in hand and my mom lying on the sofa. Both of them watching the Tonight Show with Johnny Carson. It was their time. We, the brood, all nine of us, were supposed to be in bed. It was the parents time to unwind. So here I am at nightgowns and peignoirs, a word I only just learned. The trajectory has been this: pajamas, Ken pajamas, Barbie Nightie Negligee, nightgowns (plural) and now peignoirs. The success (exposure-wise) of the Barbie Nightie Negligee probably sowed the seeds of my destruction. An Ebay search for mid-century women’s sleepwear. I need to do a better job organizing my spring clamps (there must be a second stash somewhere). I need to acquire more large, clear plastic bags to weatherize the anthotypes. I need even more Plexiglass. I am in touch with my feminine side. The first arrangements of each light resists are usually the best. Please see the illustrations(s) below. This entry was posted in Anthotypes and tagged anthotype, lingerie, nightgown, peignoir, somnambulist, tulip by Francis Schanberger. Bookmark the permalink.